Swami Ramanuja incorporated teachings from 5 different people who he considered to be his acharyas. With due respect, Kandadai Aandan carried the idol to Sriperumbudur and installed it there on the day nominated by Ramanujar. "sarva - kAlattilum sarva - chEtanarkkum sEvyamAm-paDi...". While this was being done at Sriperumbudur, at Sri Rangam Emperumanaar felt that his strength was draining out and wondered why was it happening so. He then recollected that it was the day he had nominated that day for his idol to be installed at Sriperumbudur. He at once sent a communication to Andan to come fast to Sri Rangam. On receipt of the communication Kandadai Aandan reached Sri Rangam very fast and prostrated before Emperumanaar. Emperumanaar told Kandadai Aandan to peform his final rites, as also to install his idol at the place where his body was laid to final rest. So Swami Ramanujar's utsavar thirumeni was installed by Kandadai Aandan at Sri Rangam. 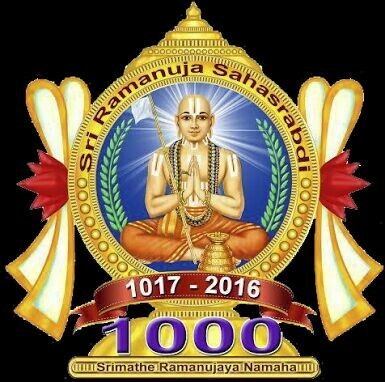 Ramanuja may have written 9 important books. They are also referred to as the nine precious gems, the Navarathnas. 1) His most famous work known as Sri Bhashyam. It is a commentary on the Brahma Sutras, known as the Vedanta Sutras of Badarayana. Gadhya Thrayam (three prose hymns). 2) Vaikunta Gadyam describing Vaikuntha, the realm of Vishnu and recommending meditating on it. 3) Sriranga Gadyam, a prayer of surrender to the feet of Ranganatha. 4) Saranagati Gadyam, an imagined dialogue between Ramanuja and Shri (Lakshmi) and Narayana where he petitions Lakshmi to recommend Narayana to give him grace. Narayana and Lakshmi accept his surrender. 5) Vedartha Sangraha (a resume of Vedanta). It sets out Ramanuja's philosophy, which is theistic (it affirms a morally perfect, omniscient and omnipotent God) and realistic (it affirms the existence and reality of a plurality of qualities, persons and objects). 6) Vedanta Saara (essence of Vedanta) an appendix to Sri Bhasya. 7) Vedanta Deepa (the light of Vedanta), another commentary to Sri Bhashya. 8) Gita Bhashya (his commentary on the Bhagavad Gita). 9) Nithya Grantham (About the day to day activities to be performed by all Sri Vaishnavas).